Our idyllic fishing village lies in the southeast of the beautiful and is 25Km away from the capital of Corfu. Apart from the mass tourism, the romantic village offers all the shopping facilities, cocktail bars, and taverns; some evenings Greek dancing parties also take place. 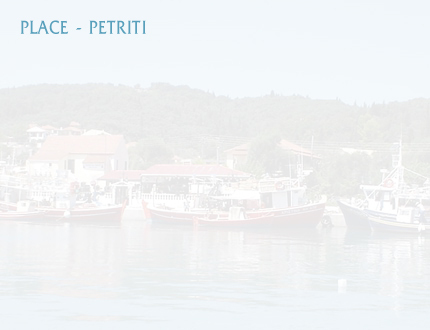 Petriti, with its delightfully harbor for fishermen, early in the morning or in the evening is crammed with all ages fishermen. It is interesting to observe how big fishes are caught; the big nets become outspread, and then is collected together as 100 years ago. Petriti, with only 700 inhabitants, was called in Ancient Greek Egrypos. Egrypos is deduced from “Ev-rous”, which means good river-course, because in the region always existed a lot of water. Egrypos lies among the green forest, from where you invite peaceful migrates, through the 200 old trees. Gladly we give you tips for individual walks up on which you can detect easily the wonderful and outstanding panorama. Worth of seeing is our breath caching mountain village Korakades with its miracle-made picture behind the church, the church itself with its bewitching picture icons, ornaments and frescoes, and the hospitality of the old people, who never leave their houses.